HomeStuffsAccel World Game	No ratings yet. Two video games based on the Accel World series were developed by Banpresto and published by Namco Bandai Games for PlayStation 3 and PlayStation Portable. 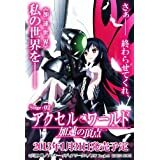 The first of these, Accel World: Awakening of the Silver Wings (アクセル・ワールド ─銀翼の覚醒─ ), was released in Japan on September 13, 2012. The second Accel World Game, Accel World: The Peak of Acceleration (アクセル・ワールド ─加速の頂点─ ), was released in Japan on January 31, 2013. The limited edition versions of these games include an original video animation of the anime series (Blu-ray Disc for the PS3 version, DVD for the PSP version).